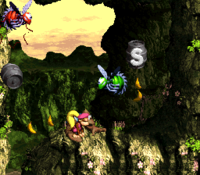 Switch Barrels are a special type of barrel that Dixie Kong and Kiddy Kong encounter during the events of Donkey Kong Country 3: Dixie Kong's Double Trouble! These special "S"-marked barrels only appear in three levels, Blazing Bazukas, Koindozer Klamber, and Criss Kross Cliffs. 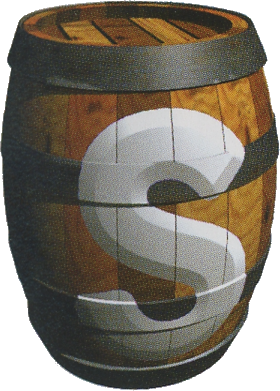 When the Kongs touch these barrels, the barrel behind the "S" changes appearance, showing the type of barrels the area's Bazukas will fire. Their barrels switch between TNT Barrels and normal barrels (in Blazing Bazukas), normal barrels and Steel Kegs (in Blazing Bazukas and Koindozer Klamber), or Steel Kegs and TNT Barrels (in Criss Kross Cliffs). This page was last edited on May 14, 2018, at 11:05.